Hard work, engaging with the community and having a flexible approach are the key elements to operating successful small businesses in the UAE, according to mum entrepreneurs. Although their journeys were different they all found ways to achieve their goals. Wehbe has a passion for languages, a natural leaning considering she was born in Kuwait, lived on and off in the UAE since 1973, has a Palestinian father, British mother and Norwegian husband. Back in 2011, she looked for a baby and toddler group in Dubai for Kai to learn Arabic. But, when she found there were none for his age, she decided to start her own — Baby Arabia, which runs Arabic, English, French and Spanish programmes for one- to eight-year-olds, with a focus on fun learning through music, stories and play. There are programmes for native and non-native speakers in nurseries, parent and toddler groups and also teacher training programmes. Another Dubai-based entrepreneur Mandy Koebke, originally from Germany, has a similar story to share. She started Toybox.ae in 2015 a year after her first son Keoki, now seven, was born. Having grown up with wooden toys she sought the same for Keoki in the UAE but couldn’t find any reasonably priced products of the same quality. She initially bought a few toys from Germany on trips home but then thought — why not start an online business dealing in the same? Toybox.ae offers Grimm’s range of wooden products including the brand’s popular 12-piece rainbow cut out by hand from a single block of wood. Aimed at children from birth to seven years old, all products are eco-friendly, safe and reasonably priced. “The main issue for a start-up was the paperwork for a trade licence, but once that was over it was the marketing that was hard going,” explains Koebke. She started selling in local markets before news spread via word of mouth. “A huge challenge for small businesses in the UAE is the constant movement of customers,” she says of the country renowned for its transient population. Balancing work and family life is tough as well — Koebke’s other son Cosmo is aged four, but she is able to control both efficiently as she can choose her hours. For Mona Tavassoli, founder and CEO of Mompreneurs Worldwide, the idea for her venture was hatched when her first son Ryan, now seven, was born in Dubai in 2011. Mona, who was then involved in a joint business venture with her husband, realised that many expat mothers in the UAE with families in other countries sorely needed a support group. “Motherhood could feel overwhelming at times,” says Mona, who went on to create Mom Souq, an online marketplace where new mothers could engage, exchange and sell their used baby products and items children fast outgrow. 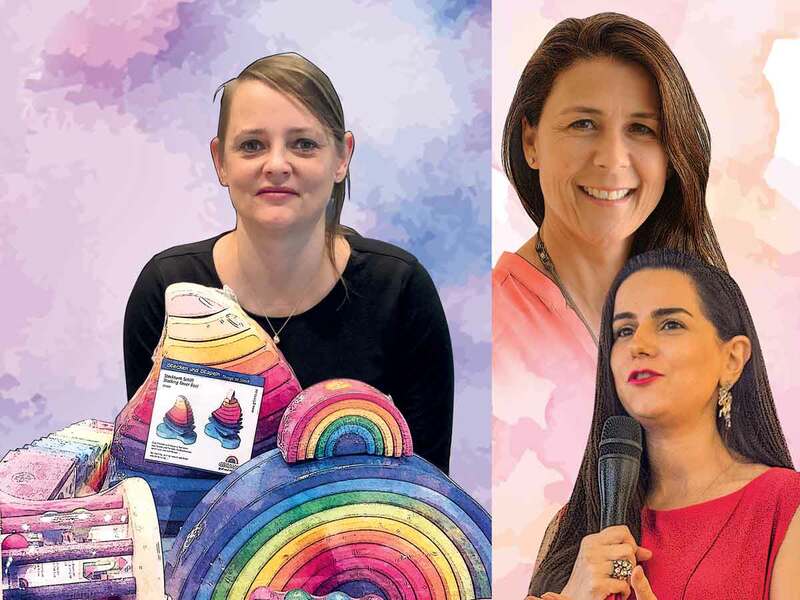 The platform attracted requests from mum entrepreneurs wanting to connect and as a result Tavassoli formed a separate B2B platform called Mompreneurs Middle East to help them promote and grow their businesses. “I strongly believe that empowered mothers raise empowered leaders. It is one of our biggest responsibilities as mums to invest in ourselves,” she says. She recently realised that running a successful business and bringing up a family — her second son Darian was born in 2015 — was not limited to one region and rebranded the business to Mompreneurs Worldwide, connecting with women entrepreneurs from around the world. The website is based out of Canada and the UAE. As these three women have proved, a newborn can bring new life to mum in more ways than she could have imagined.